We had book a tour to visit Husky Homestead which is run by 4 time Iditarod champion Jeff King. As soon as you get off the bus they put some of the puppies in your hands which sets the tone of the visit. Jeff gave the presentation along with some of the handlers and of course the dogs. The weather started to turn on us while we were there and it started to rain. When we got back to the hotel we decided that we weren't going to let a little rain stop us so we broke out the rain gear and did another short hike in the park. This time we did see a beaver, but that was it. 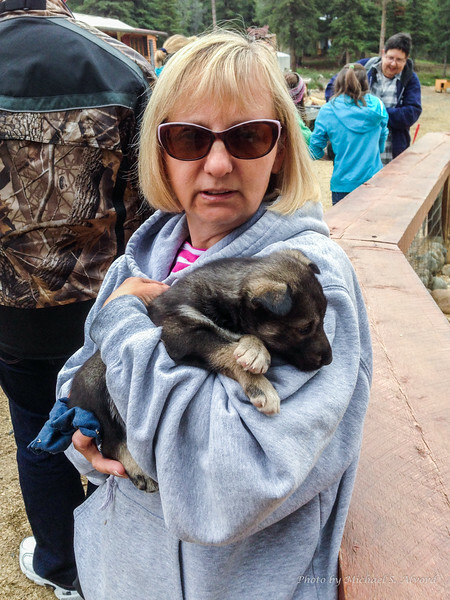 We went to the Husky Homestead which is run by 4 time Iditarod champion Jeff King.